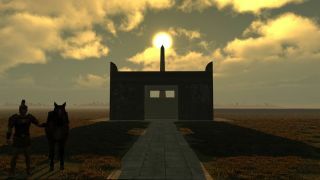 This virtual simulation shows the sun atop the obelisk with the Altar of Peace in the foreground. There is nothing I love more than a great astronomical history mystery story and today our sister site LiveScience has this great one to share: Using NASA data and computer simulations, scientists have managed to finally reveal exactly how the sun lined up with an Egyptian obelisk at the heart of an ancient Roman sundial. The new study apparently settles a long-standing mystery of the Ara Pacis ("Altar of Peace"), which dates back to the year 9 B.C. and was built to honor an era of peace ushered in by Rome's first emperor Augustus, according to LiveScience. That era was known as the Pax Romana. In ancient times, the Ara Pacis building on the Tiber River doubled as a giant sundial —or gnomon —with the help if a nearby Egyptian obelisk taken from Heliopolis. Historians have long suspected that the sun would line up with the obelisk and Ara Pacis to cast a shadow in the building's plaza on Sept. 23, the birthday of Augustus. But using computer simulations and NASA's star-plotting Horizons System, the scientists discovered the alignment actually occurs on Oct. 9, which is the annual festival of the Temple of Palatine Apollo. Neat, huh? I love archaeoastronomy. You can read the full story here on LiveScience by Megan Gannon.